The same year that the United States nominated its first female major-party presidential candidate, the Metropolitan Opera presented, for the first time in over a century, an opera composed by a woman: Kaija Saariaho’s L’Amour de Loin. The last opera composed by a woman performed at the Met was British composer Ethel Smyth’s one-act opera, Der Wald. Dismissed at its 1903 performance by the New York Times as “a disappointing novelty,” the next 113 years of Met produc­tions would be of the works by men. The presence of women at the Met was long in coming in other domains as well: by 1960 there were only two women instrumentalists in the Met orchestra, a violinist and the second harpist. The enormous gender asymmetry made for some interesting professional challenges for these women: the harpist’s solution to the absence of a female dressing room for orchestra musicians was to change into concert attire inside her harp case! A whirlwind of publicity preceded the Met’s production of L’Amour de Loin. Conducted by Susanna Mälkki, the fourth female conductor to lead a production with the Metropolitan Opera and first woman to conduct at La Scala in 2011, the production was a high-profile affirma­tion of the voices of dozens of women composers, performers, and conductors chiseling cracks in the lofty ceilings of institutions like the Met. Although Saariaho herself has understandably sought to avoid the image of a “female” composer and a gendered reception of her music, the opera was received by the New York City concert-going community and the press as a “milestone” event for women in the arts. Tamara Mumford as the Pilgrim, Eric Owens as Jaufré Rudel and Susanna Phillips as Clémence in Kaija Saariaho’s L’Amour de Loin. Photo by Ken Howard/Metropolitan Opera. The Met’s decision to stage L’Amour de Loin was anything but a daring gamble, however. Before its production at the Met, L’Amour de Loin had already enjoyed ten productions on three continents since its premiere at the Salzburg Festival in 2000. Kaija Saariaho herself is arguably one of the most internationally renowned composers of her generation. Born in Finland in 1952, Saariaho studied with Paavo Heininen at the Sibelius Academy before study and research at Freiburg and at Paris at the Institut de Recherche et Coordination Acoustique/Musique (IRCAM). Known for her luxurious textures and harmonies, Saariaho’s training in acoustics and spectral analysis inspires her signature blend of new technology with writing for traditional Western instruments and her systematic approach to building harmonic structures. Before the composition of L’Amour de Loin, Saariaho had shied away from the daunting and all-consuming operatic genre. But the composer has stated that the simple, poignant story of the twelfth-century troubadour Jaufré Rudel de Blaye (the semi-fictional protagonist of the libretto is based on the historical figure of the same name) stimulated her to take a stab at an opera with the collaboration of Amin Maalouf as librettist. According to legend, Jaufré fell in love with Clémence, Countess of Tripoli, after hearing reports of her from a homecoming pilgrim. After making the voyage across the sea to meet his beloved, Jaufré died upon reaching the distant shore. In the opera, Saariaho evokes a medieval aura with a melodic language inspired by the monophonic songs of troubadours accompanied with splashes of orchestration hinting at rebecs and harps, while the libretto is rich with quotations in French and Occitan of the historical Jaufré’s own poetry. These ancient flavors are encased in Saariaho’s modernist sonic surfaces. Each of the three personages (Jaufré, Clémence, and the Pilgrim) are characterized by distinct melodic writing, chords, and orchestration. Over the course of the opera, Jaufré’s and Clémence’s material gradually combine and merge into one. The effect is an organic crescendo of increasing complexity, the movement and changes of which are scarcely perceptible at the micro-level. Because the small number of seminal materials is slowly elaborated over a large timescale, an effective performance of the work is quite a challenge. Saariaho’s music is often described as “lush,” “a wash of color,” “sensuous,” or indeed “feminine” to judge from the Met’s program notes and reviews and essays from both Europe and the United States. Perhaps the fact that many of her compositions take inspiration from the natural world and that her perception is synesthetic leads some commentators to depict this composer as a kind of female oracle, mystically in touch with a cosmos pregnant with sounds waiting to be unleashed at the stroke of her pen. Fellow composer Juhani Nuorvala has described her music as, “[a] fragile, brilliant play of color, a sensuality, a dream-like mysterious atmosphere.” While the immediate effect of Saariaho’s sonorities in L’Amour de Loin is indeed colorful and rich, this belies her sometimes underappreciated structural asceticism. Saariaho’s score is built upon a severely limited number of pitch fields and melody types, which, although elaborated, rotate throughout the entire opera. Harmonies are unapologetically prolonged over seemingly interminable pedals, creating the aural effect of sonic stasis. Her dogged insistence on building the two-hour opera out of such restricted musical materials deployed over such vast periods suggests a steely determination inconsistent with some of the more “feminine” strains of her reception. Saariaho’s asceticism extends to goal-oriented motion as well: although her writing involves harmonic and melodic direction and achievement, never does she wallow in a moment of ecstasy. Saariaho’s unique musical admixture challenges the libretto and staging to find a similar balance between richness and austerity, all while sustaining interest throughout the glacial musical development. The plot, like the formal structure of the music, is comprised of few elements. Yet while her musical language is clearly her own, the plot of L’Amour de Loin is archetypically familiar from many canonic operas. Jaufré’s death upon finally uniting with his beloved is reminiscent of Tristan and Isolde to name but one example, and the poet figure of Jaufré is redolent of the title roles in L’Orfeo or Die Meistersinger von Nürnberg. The use of Greek-style choruses reminds one of early baroque operas or classical tragedies. On the one hand, this is an appealing kind of self-conscious imbrication in a long tradition, as if the creative team adopted a posture of respectful deference for its forbears. On the other hand, since stories of love, death, illusion, and sublimation have been played with in opera for hundreds of years, I expected a new opera recycling the familiar symbols and allegories of these themes to provide a unique take on the story. While it was evident that librettist Amin Maalouf crafted his language to echo Saariaho’s structural goals of simplicity, and though it was rich in literate allusion to Machaut and Chrétien de Troyes, much of it felt crammed with over-tired language at times saccharine and trite. For this listener, the libretto very much fell flat and hindered my enjoyment of the opera. The Met’s presentation, which opened on December 1, 2016, was a new production by actor, playwright, and film and stage director Robert Lepage. Lepage aimed to represent the psychologies of the characters by reflecting them in the humors of the sea, an arresting effect created through 38,000 computer-programmed LED lights stretched across the stage. Previously, Lepage has produced for the Met Berlioz’s Damnation of Faust (2008) and the acclaimed Ring Cycle (2010–2012). Lepage’s production, like Saariaho’s music, was stark. Besides the LED lights, the only other set elements were the boat of the Pilgrim and a raised contraption upon which Jaufré and Clémence stood in alternation. The contraption resembled a barge or pier when flat, but which could swivel and transform into a flight of stairs, thus creating an illusion of cinematic changes of perspective. The stage production did at times create a compelling impression of untethered bodies floating across vast distances. Although the libretto, music, and staging could be appealing and moving in short periods, together they did not sustain my unwaning interest across the long-range span of the first four acts when I attended on December 21. The writing and performance of the fifth act, however, vindicated the opera. At last the union of Jaufré’s and Clémence’s musics has been accomplished. After the death of Jaufré, the music seems to rip at its seams as Clémence, sung by Susanna Phillips, traverses the watery limit between vocality, speech, and noise. Phillips’ conviction of interpretation in this act was both thrilling and affective: she plunged, clawed, and ebbed between song and inarticulate cries, diving from shimmering and bell-like tone to throaty despair in dizzying glissandi. 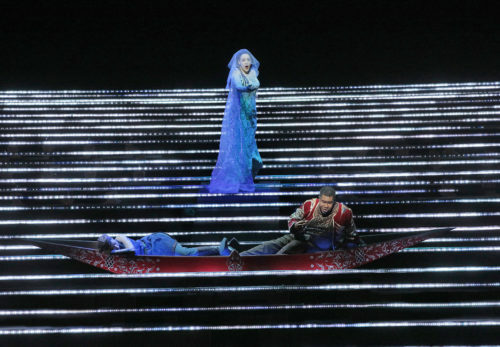 Though the plot at this point is as predictable as ever (the love of Clémence is sublimated in a blurring of Jaufré and God as Clémence resolves to enter a con­vent), Saariaho’s musical take on “love from afar” is singular. Whereas in the last act of Tristan and Isolde earthly love is sublimated in an orgasmic exaltation of goal-directed longing, the end of L’Amour de Loin, in which love is similarly sublimated, is terrifyingly austere. While the orchestration continues to provide a sumptuous harmonic surface, the presence of heightened, almost martial rhythm and piercing melodic movement by the chorus lends an air of foreboding. Clémence ends the opera with a musical question mark, hovering uncertainly atop scintillating harmonics evoking the opening of the opera. The combination of Saariaho’s uncompromising writing with Susanna Phillips’ riveting performance and Susanna Mälkki’s frighteningly lucid conducting, closed the opera on an electrifying note. Farther uptown, a fellow woman composer of Saariaho’s generation, Misato Mochizuki (b. 1969), was featured in Miller Theatre’s Composer Portraits on March 2, 2017. Miller Theatre brought back to me fond memories from my undergraduate days at Columbia College of crammed “Frontiers of Science” lectures and Columbia Symphony concerts, and I was pleased to experience once again the buzz of artistic and intellectual curiosity I associate with that venue. Mochizuki began her musical studies in her native country of Japan and, like Saariaho, then com­pleted them in Paris at IRCAM. Over the past half-decade, Mochizuki has begun to receive recognition in the United States with the performances of her works at the Lincoln Center Festival, The Juilliard School, and the Metropolitan Museum of Art. Her works are more widely known in Japan, where she holds a position at Meiji Gakuin University, and in Europe, where she spends part of the year teaching and working. The March 2 program presented an interesting assortment of Mochizuki’s works written between 1998 and 2010, four of which were U.S. pre­mieres. The performing forces were comprised of the Queens-based percussion and piano quartet Yarn/Wire playing as an ensemble and as soloists, the JACK Quartet, and oboist James Austin Smith. The evening began with a captivating interpretation of Quark—Intermezzi III (2010) for solo percussion, performed by Russell Greenberg. The third piece in a series of instrumental intermezzi, Mochizuki’s Intermezzi explore the idea and identity of the fragment (in Roland Barthes’s sense) and the shapes and emotions evoked from the linking of musical fragments. Opening theatrically with the stage darkened but for the backdrop of the theatre, the silhouettes of instru­ments onstage lurked darkly beyond the proscenium. Above the quiet hum of the building, one could just gradually make out the curious sound of the buzz bow, the descendant of an ancient instrument called the bull roarer. The shadowy form of the percussionist deftly swinging the buzz bows mingled with the silhouettes of the instruments before Greenberg turned to the bass drum and tam-tam. I had the impression that I was witnessing some shamanistic ritual in which the audience was somehow deeply implicated, though ignorant of the goal of the rites. I recall thinking that I was observing not the playing of percussion instruments, but rather experimentation in musical alchemy. Greenberg, who performed from memory, was the magician testing the resonant bodies, enlivening them, coaxing and persuading them to speak and mix with each other. As the piece grew to a close, one could make out the silhouette of the next performer, Ning Yu, at the piano—almost as if Greenberg had conjured her presence. The next piece began continuously, with the stage still somewhat darkened. The sound of the piano dovetailing with the hypnotizing effects of the Intermezzi III was not completely satisfying. Miller Theatre is a difficult, dry acoustic place to work in, and the percussion instruments were the most successful to project resonance over the course of the concert. Moebius-Ring (2003) for solo piano was intended as a sequence of variations based on repetitive pulsations from which the piano tries to escape but invariably returns. To my ear, the relationship of the variations to one another were not clear, and the dramatic arc of the composition was confusing. However, in the writing I sensed a playful and creative compositional mind ripe with ideas in dialogue with past masters. Amidst Yu’s virtuosic interpretation, I thought I heard echoes and commentary upon Debussy and Chopin piano preludes. The performance of Mochizuki’s first string quartet Terres rouges (2005–2006) by the JACK Quartet brought the theatre to a more traditional concert ambience—the lights returned to standard stage lighting, and the quartet entered conventionally to applause. The piece was a ripe sixteen minutes of continuous scurrying activity amongst the four instruments. The writing is devilishly tricky, and the JACK Quartet was eminently competent and professional in their performance of it, executing an array of technical and rhythmic feats with admirable accuracy and precision. However, perhaps in part due to the concentration required of each individual in this particular piece, I had the curious and disconcerting impression of observing four individuals who, as if it were unbeknownst to them, happened to be playing the same piece at exactly the same time. The picture of four men diligently at work attired in business suits, with scarcely a glance shared among them, was strangely bureaucratic. Admittedly the acoustics of Miller Theatre were certainly not on their side; nevertheless there did not seem to be an effort on the whole to experiment with a variety of sounds. Intermission was followed by the shortest and oldest work on the program, Au bleu bois (1998), for solo oboe performed by James Austin Smith. The composition was a lyrical refreshment after the frenzied activity of Terres rouges and was performed elegantly and with sinuous sound by Smith. The final piece on the program, Le monde des ronds et des carrés (2015), was commissioned by Yarn/Wire for the 2015 Lincoln Center Festival. As described by the composer, the piece “attempts to install, in space and in music, geometric combinations arising from the shapes mentioned in the title—circles and squares—in exploring the relationships possible among the musicians, whether opposed to one another (square) or united (circle).” Mochizuki recalls having the seventieth anniversary of the end of WWII in mind as she worked on the piece. The percussionists began the piece with a procession accompanied by crotales and Japanese cup bells (rin) starting from behind the audience and culminating in a perambulation around the pianos on stage. Though this choreography was a risky gimmick that could easily have fallen flat, the aural effect of the movement of the crotales and rin was gripping. Dramatic and musical tension came to a climax at the end of the piece, in which percussionist Ian Antonio was joined by each of the members of Yarn/Wire at the trap set. The four surrounding the drum kit were united in a kind of circle and a sharing of the same instrument; however, the collective music played upon the instrument was fraught with division and conflict. Le monde des ronds et des carrés was moving, and Yarn/Wire played with verve and charismatic ensemble. I thought, however, that the work could have benefited from an expansion—the material and ideas behind the piece could be further developed, and the periods of growth and climax (especially the ending idea) might be more effective if drawn out longer. I left the concert intrigued and refreshed by the array of Mochizuki’s works and wishing to know more, especially large-scale works. The performances of Saariaho’s L’Amour de Loin in December and Mochizuki’s Composer Portrait in March were treated by their audiences as works of high art to be received and interpreted with gravitas. A more lighthearted side of modern classical music was given the limelight in a performance on March 3 at the Metropolitan Museum of Art. This program, “Modern Voices,” presented by METLiveArts, was performed by the PUBLIQuartet—the Metropolitan Museum of Art’s Quartet-in-Residence. Their program focused on works by composers generally somewhat younger than Saariaho and Mochizuki. Interestingly, in many of these compositions, a unifying theme seemed to be a musical reflection upon a day-to-day object or phenomenon rather than an event or emotional state. For example, some sources of creative inspiration described by the composers in the program notes included surface tension on water, an orange, and the hum of drones in buildings. The resulting music from these observations seemed to me to have the flavors and good nature of art to live with rather than to scrutinize and ponder with furrowed brow. From this perspective, I thought that the program was a useful and enjoyable exploration of a more accessible strain of contemporary music. The concert was presented in the Grace Rainey Rogers Auditorium, accessed through the impressive Egyptian Wing of the Met. As described by the program notes of the PUBLIQuartet, the program was designed “to capture the élan of the voices that define our contemporary classical world, paired with those that take on these reins to kick us to that next place, that next sound, that next feeling and frontier.” The ensemble was also joined by guests violist Nadia Sirota and percussionist Ian Rosenbaum. The compositions of two composers on the program were created through PUBLIQuartet’s emerging composers competition, PUBLIQ Access. Over the past two years, PUBLIQ Access has received over three hundred submissions. Composers who are selected receive a commis­sion fee and participate in a year-long process to create a new work in collaboration with PUBLIQuartet. These two works, Surface Tension (2012) by David Biedenbender (b. 1984) and Great Danger, Keep Out (2013) by Matthew Browne (b. 1988), framed the program. Caroline Shaw’s Valencia (2012), selections from an a new arrangement of Nico Muhly’s Drones & Viola and Drones & Violin (2011/2012) for quartet and viola, and the world premiere of Andy Akiho’s LIgNEouS for marimba and string quartet (2010/2016) filled out the program. LIgNEeouS had started out as a self-contained one-movement work in 2010; I first became familiar with the work in this early form several years ago. Akiho has since composed four additional movements which refer back to and develop the motives of the original first movement. Although I heard some compelling writing in the additional movements and appreciated Akiho’s gestures toward motivic unity, the work now seems to me stretched beyond its capacity. As far as I could tell, the first (original) movement of the set has not been altered since 2010; to my ear, the ideas of that movement could not sustain the new long-form structure. Caroline Shaw was the only female composer to be represented on “Modern Voices.” Shaw is the youngest person ever to win the Pulitzer Prize for Music for her Partita for 8 Voices written for the ensemble Roomful of Teeth. A concertizing violinist and vocalist as well as composer, Shaw is currently a doctoral candidate at Princeton University. Her short work for string quartet, Valencia, Shaw described in the program notes as “an untethered embrace of the architecture of the common Valencia orange, through billowing harmonics and somewhat viscous chords and melodies.” The quartet was a pleasant blend of Ravel-like textures and harmonies, with melodies and scoring somewhat reminiscent of Copland. However, surrounded by compositions of very similar style, I didn’t get a sense of this composer’s individual voice, nor many of the others’. PUBLIQuartet projected a warm and agreeable stage presence concordant with the moods of many of the pieces, and I sensed a bond of conviviality and mutual enjoyment amongst the players. Their performances on March 3 were strong and robust, and they cultivated a genial rapport with their audience. The balance in the Grace Rainey Rogers Auditorium was not quite correct, however. The cellist, who was sitting on the outside “house right” facing toward the first violin on a cello podium, was often underbalanced, and I often wondered if the quartet might find a more advantageous setup. A highlight of the performance was violist Nadia Sirota’s appearance in Nico Muhly’s Drones & Viola and Drones & Violin. While it was enjoyable to explore this more easy-going, fun-loving side of new music, the program for “Modern Voices” I thought was wanting variety and stylistic challenges. Though the quartet guaranteed the appeal to a wide audience with their selections, the similarity in style and techniques of all five of the compositions projected complacency with a prevailing style of string quartet writing, not the touted inclusion of “those who take [the] reins to kick us to that next place.” Nearly all the pieces conformed in general to a familiar quasi-diatonic, pop and folk-infused style, which relied on interspersed extended effects. While I don’t criticize this style in and of itself, and I myself liked most of the pieces, the lack of variety on the program was potentially problematic given the stated goals of the project. It may be the case that different choices from the respective composers might have provided the diversity suggested by the program notes, rather than producing the effect of somewhat dissolving the composers’ individuality. As quoted in Pirkko Moisala, Kaija Saariaho (Urbana, 2009), p. 28. Caption: Tamara Mumford as the Pilgrim and Susanna Phillips as Clémence in Kaija Saariaho’s L’Amour de Loin. Photo by Ken Howard/Metropolitan Opera. Arts Review from the Spring 2017 issue.